Can We Prevent Another Blackout? 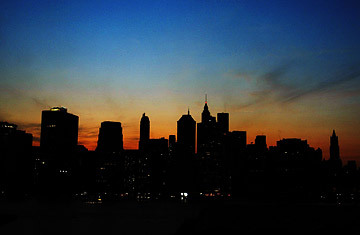 The sun sets over the Manhattan skyline during a major power outage in 2003. It started with a tree in need of a trim. At 3:05 p.m. on Aug. 14, 2003, a 345-kV transmission line in northern Ohio began to sag. This happens commonly, especially during hot summer days, when the demand for power created by all those air conditioners can cause power lines to slacken. Trees near transmission lines are supposed to be pruned regularly  but this one hadn't been. When the line sagged too close to the tree, it faulted and tripped off-line. This is also something that happens pretty frequently on the U.S.'s massive electrical grid. But the breakdown of that line in northern Ohio began a cascade of failures that, in a little more than an hour, led to a near total power loss for more than 50 million people in the northeastern U.S. and parts of Canada. Full power wouldn't be restored for everyone in the affected area until Aug. 18. It was the largest blackout in North American history  and five years later, with the grid sagging again under the weight of increased energy demand, there's no guarantee that we won't see another outage. Tracing the causes behind the 2003 blackout reveals just how unwieldy and vulnerable our electric grid has become. When that first transmission line in northern Ohio went off-line, it wiped out the redundancy and excess capacity built into the northeastern grid  and more things went wrong. First Energy, which was responsible for powering northern Ohio, should have detected the loss of that first line, but its energy management system wasn't working at the time (the company didn't know that). Higher up, the Midwest Independent System Operator's state estimator, which helps ensure reliability for several utility companies in the region, had just been taken down for troubleshooting that day, and wasn't fully back online yet, so operators were unable to get an accurate, real-time picture of what was happening to the grid. Daigle is a member of the U.S.Canada Power Outage Task Force, which investigated the causes behind the blackout, and worked on ways to prevent another one  but that may not be possible. He calls the blackout a "once in 10 years event," and past blackouts in 1996, 1977 and 1965 bear that out. (After the 2003 event, Daigle notes, some utility operators in western Europe said that such a widespread blackout could never occur with the continent's better designed grid  but in fact a major failure hit their system just a couple months later.) "[Failure] is always possible," says Daigle. "But we have to find ways to reduce the possibility." One lesson from the 2003 blackout is that utilities needed more oversight. Before the blackout, Daigle notes, regulations on utility reliability depended on little more than "peer pressure." That's been beefed up in the years since, with tougher audits of utility systems and steeper fines for failures. But more importantly, we need to enhance what Daigle calls "situational awareness," or, in other words, the intelligence of the grid. The system failed in 2003 not so much because of unkempt trees and a few sagging lines, but because no one knew what was going on until it was too late. Utilities can't talk to each other, and often can't even talk to themselves. Most utilities don't know that users have lost power until customers pick up the phone and call them. Electricity now powers devices of amazing technological sophistication, from lightning-fast desktop computers to flat screen TVs. But our means of getting power from the plant to the plug hasn't changed much since the early 20th century. Making the grid smarter will take real investment, but that's been lagging, and like much of our infrastructure, the grid is overdue for an overhaul. "Government funding has been pretty modest in scale," says Daigle. He notes that last year's federal energy act contained authorization for smart grid investment  but no money has been appropriated yet. That needs to change. As electricity demand increases in the U.S. and we become ever more networked, the consequences of a major power loss worsen as well. The blackout of 2003 cost some $6 billion, but it could have been far more costly. A smarter grid can also help improve energy efficiency  if customers and utilities know exactly how much electricity they are using in real-time, they should be able to cut waste. Five years after the blackout, it's past time to get smarter about our electricity.